Our 2017 has been quite a year. 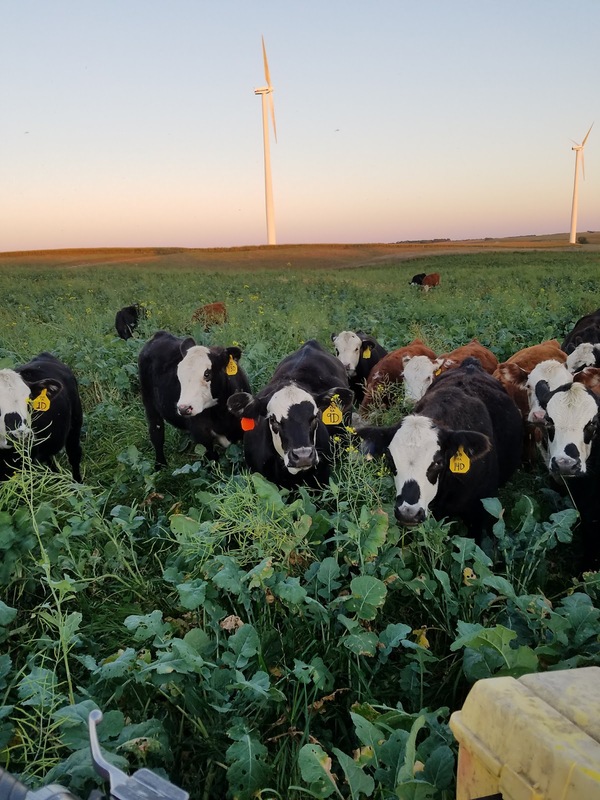 We more than doubled the amount of tillable acres we operate through two new rental contracts and brought in an additional 150 feeder calves to graze cover crop this fall. The additional workload this spring and fall has pushed my sanity to the limit. 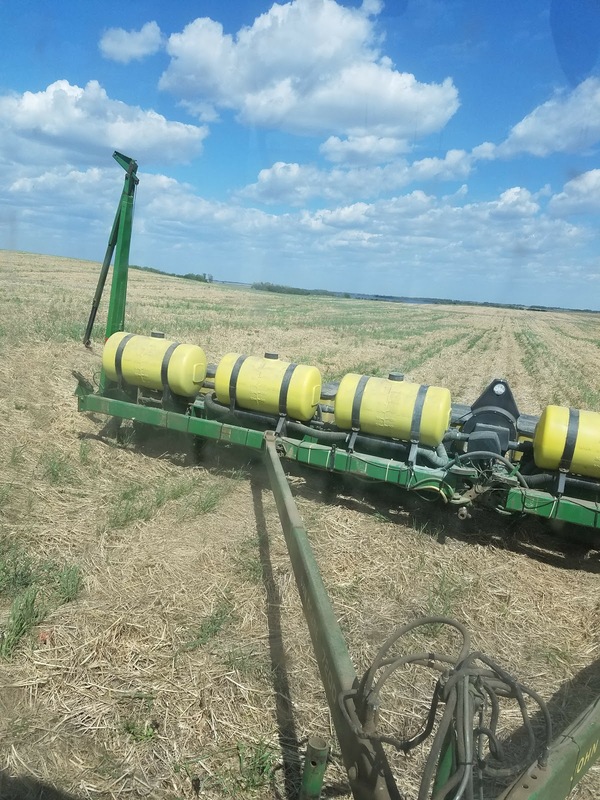 This year, like all the others, has provided me with a sharp learning curve regarding cover crop selection and termination procedures, and low crop prices continue to make farming a formidable challenge. However, the most important event this year was the birth of our little girl Eden which I will fawn over at the end of the post. 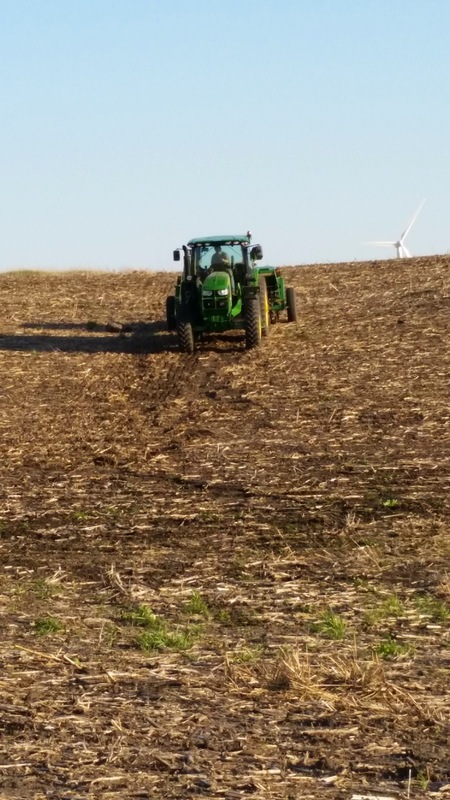 No-tilling corn into a grazed cover crop. Corn follows the wheat/cover crops in our rotation. Some of the cover crop was grazed last fall and some didn't have any cattle grazing it and was allowed to grow uninhibited. The number one problem with no-till corn is getting a good stand established into the previous years crop residue. So needless to say, stand establishment was a much greater challenge in the cover crop that wasn't grazed. Even though the residue managers on our corn planter were set rather aggressively and the down pressure was maxed out, the residue in some areas was just too thick to establish a proper stand of corn. If the cover crop is not grazed down to eliminate some of the residue prior to planting corn, I believe it needs to be strip-tilled. Perhaps some of the newer model planters with pneumatic down pressure and residue managers would be up to the task of planting into that much residue but our older planter was not up to the job. Thinking on the positive side though, with all that residue covering the soil surface we pretty much eliminated any erosion potential. This spring was very wet, making planting and spraying windows very slim and hard to come by. Terminating winter hardy cover crops on time became very difficult. One field being planted to corn had red clover and rye grass coming back from the previous year. Yes rye grass. I was happy for the good stand of red clover and the supplemental nitrogen it would supply. 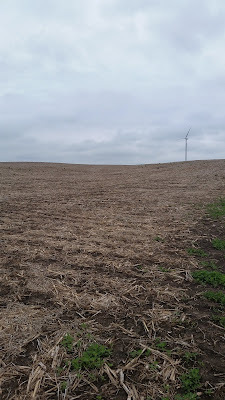 I no-tilled corn directly into this field but was unable to come back and terminate the cover crop for almost two weeks. Red clover can be a very impressive weed smothering plant. Unfortunately, this made it very good at choking out corn as well. Even after terminating the cover crop it was very difficult for the corn plant to push up through the mass of dead red clover and rye grass. We did strip-till a few passes in the middle of the field for a comparison. It became very evident on the yield map exactly where those passes were because the stand of corn, and thus the yield, was much better. "Lucky" doesn't even begin to describe it. I'm the type of person who likes to save the best for last. The most important and life changing event this year was the arrival of our little girl Eden on June 15th. She came six and a half weeks early and spent three weeks at Children's Hospital in Minneapolis before she got to come home on the 4th of July. 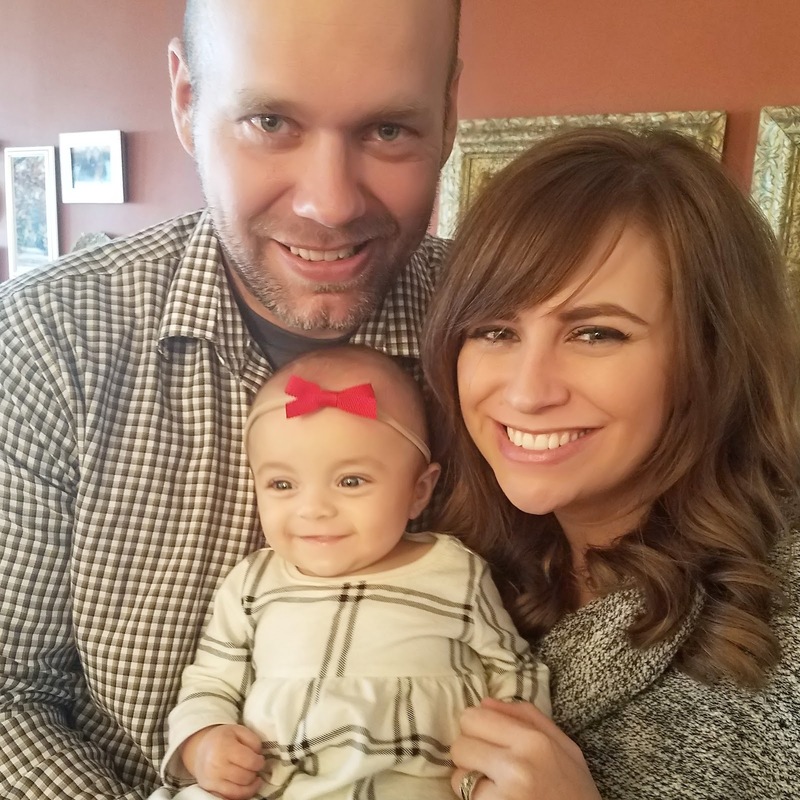 Sara spent the majority of May at the Mother-Baby Center in Minneapolis (right across from Children's) because she developed preeclampsia while in the twin cities for work. Her blood pressure could no longer be controlled so doctors performed an emergency c-section at 10:45 PM on June 15th for Sara and Eden's safety. I have never witnessed such compassion and professionalism as I did from the staff at Children's and the Mother-Baby Center. Words can not do justice to how incredible the nursing staff and doctors were at these two hospitals. Eden just turned six months old earlier this week and I find the time going by much too fast. She loves to be held and can melt her daddy's heart with a smile or a giggle. Truth be told, I wouldn't mind if she stayed this age. She has made this our best year yet and we are extremely grateful. We wish everyone a merry Christmas and a happy New Year. Thanks for reading. Notice how tall the rapeseed is. Last year was the first time we grazed cover crops with cattle. 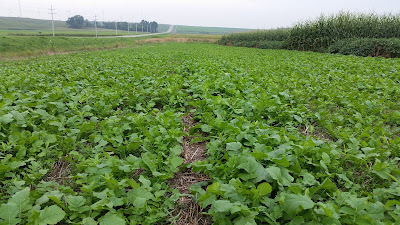 The cover crops were drilled following oat and wheat harvest and consisted of turnips, radish, and clover, along with the volunteer small grain that went through the combine. 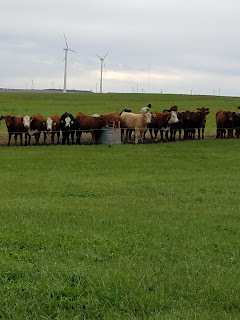 We turned in 40 head of bred cows to graze 40 acres in mid-September and grazed until mid-November, when the water tanks would no longer stay thawed. There was still ample forage left (I would estimate at least 2-3 weeks worth) when the cows were pulled out. The cows did fantastic and went into winter in excellent body condition. This led me to think that with the forage quality being that high, it would be better served adding weight to weaned calves instead of grazing bred cows. After doing a lot of reading and research over the winter, we went into 2016 with a plan to wean and background our own calves on a post-small-grain cover crop rather than selling them directly off the cow. 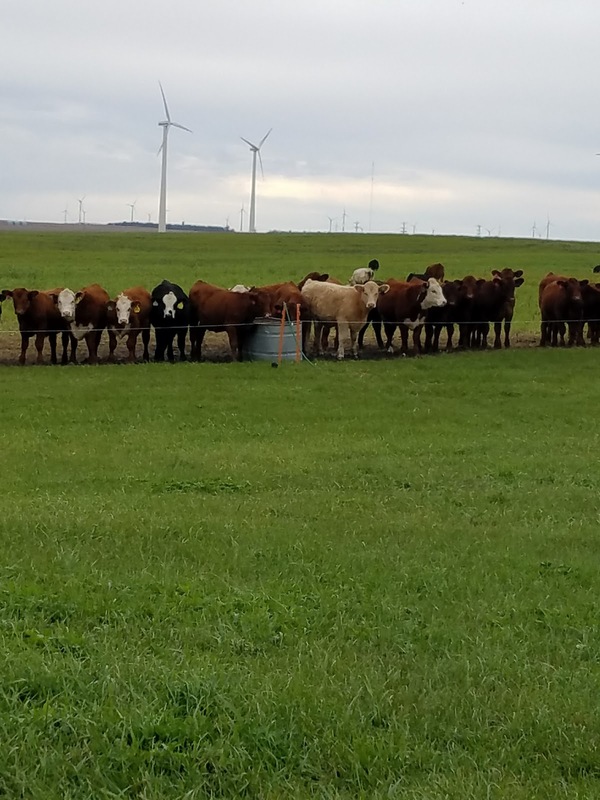 With the cattle market down about 50 percent compared to 18 months prior, it doesn't hurt to add a little more value to the calves before they are marketed. We fence-line weaned our calves in the first week of September and had them out grazing cover crops 7 days later. It was also a first for us using a fence-line weaning method, and I can say we are now strong believers in the practice. However, that is a topic for a future post. The steers were put out on the cover crop weighing 523 pounds while the heifers were at 507 pounds. University of Minnesota trials resulted in a 2.23 lb/day gain on a similar cover crop mix, so we are shooting for a 2 lb/day gain (read about the trials here.). The calves have adjusted to their diet and look great, so I doubt we'll have any problem reaching that rate of gain. Our view off the back porch is awesome. The first field grazed consisted of a mix of ryegrass, clover, rapeseed, and oats; relative feed value tested at 296. I would advise against including rapeseed in this mix. The calves would typically graze the much-shorter ryegrass first, which I think may have led to their eyes getting scratched by the rapeseed. Their eyes therefore teared excessively, causing a few cases of pinkeye to pop up. I treated any affected calves with tetracycline, administered by a Cap-Chur dart rifle. We then decided to move the calves over to a different 40 acre cover crop field until the flies were thinned out by a frost. The cover crop in this field consisted of oats, clover, rye, and radish. The second field of cover crops the calves were moved to had only a single-strand of high tensile wire along the road, and a single-poly wire held up by temporary plastic fence posts on the majority of the fence line. I will admit that I was extremely nervous of the calves getting out. Visions of calves running down the road in every direction had been planted in my head by skeptics. To date, we have had no problems with calves getting through the fence. I am, however, very picky (possibly fanatical) about checking the fence and making sure it's "hot." As of November 7th, we have grown approximately 133 pounds of feeder calf/acre with about 3-4 weeks worth of forage remaining. If we are able to keep the calves out grazing for another 3 weeks, each acre will have produced about 196 pounds of feeder calf with the only additional major expense being cover crop seed and drilling. I believe we are being mildly conservative with our goal of 2lb/day/calf of gain, but we'll know for sure when the calves are weighed in a few weeks. With the agriculture sector in poor shape, thinking outside the box, trying something different, and putting in a little extra work, can mean the difference between a profit or a loss. My advice: sell that tillage equipment and buy some cattle. Thanks for reading. There is a growing interest in more non-mainstream agricultural practices lately and for good reason. As profit margins grow thinner, farmers have begun to seriously look for ways to reduce costs and keep the red ink pen in the drawer. Some are more open minded than others. While in the company of certain farmers, big time operators (BTO) and small time operators (STO) alike, I've been poked fun of for talking about cover crops and having a small grain in my crop rotation. That combination however, made us more money this past year than corn or soybeans. Nonetheless, I firmly believe that if people aren't skeptically wondering about what we're doing then I'm not pushing the envelope far enough. 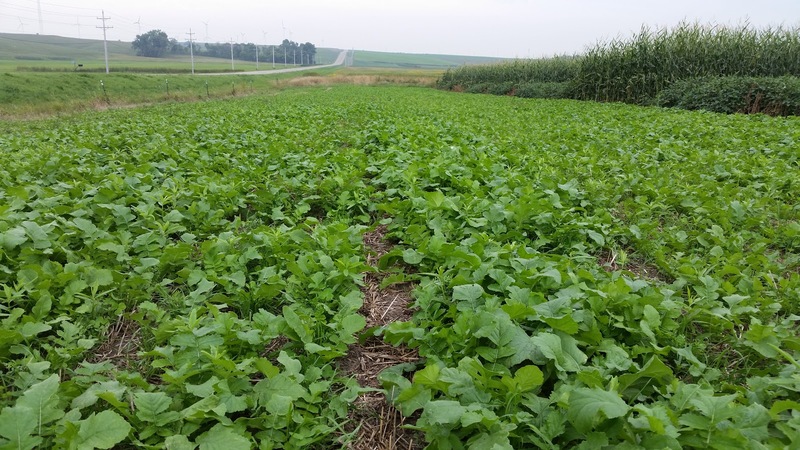 If used correctly, we have found that cover crops can improve the profit margins of our grain farm as well as our livestock operation. 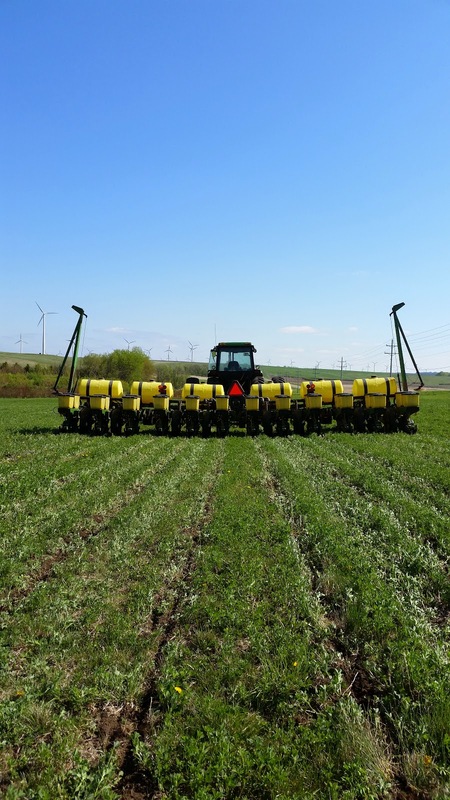 Using practices that intertwine grain farming, cover crops, and livestock works better for us and has been more profitable than each could have been alone. Going into this down cycle of agriculture, I am confident that our diversification into more than just corn and soybeans will carry us through. Corn-soybean strip cropping trial. Yield was very impressive. most profitable practice in 2015.
our operation to dictate what practices we use or don't use. I am not implying all older (or younger) farmers are reluctant to embrace new or unpopular practices; some of the operators implementing the same practices I have are well into their 70's. Age does not always determine an open mind. I believe it is a responsibility of all farmers to continually search for a better way to operate during their tenure as a steward of the land. We should leave the land in better condition than when we received it. Trying new things means I fail.... A LOT. But we learn, and our operation is more profitable and efficient because of it. No one likes to have a field that is a train wreck, myself included. Train wrecks lose money and can be an embarrassing reminder of what went wrong all summer long. However,with careful planning and intense management we have managed to avoid any total disasters so far. There are certainly risks with trying new practices, which is why thorough research is necessary. The risks involved in trying something new seem much smaller than the potential long-term risks of never progressing in the science of agriculture. So if you take anything away from reading this post I hope it's this: don't be afraid to have an open mind and ask questions. I love talking about ways to improve our farm as well as our farming methods. Agricultural practices are continuously evolving and so should your thought process; "that's how we've always done it" is a dangerous frame of mind. 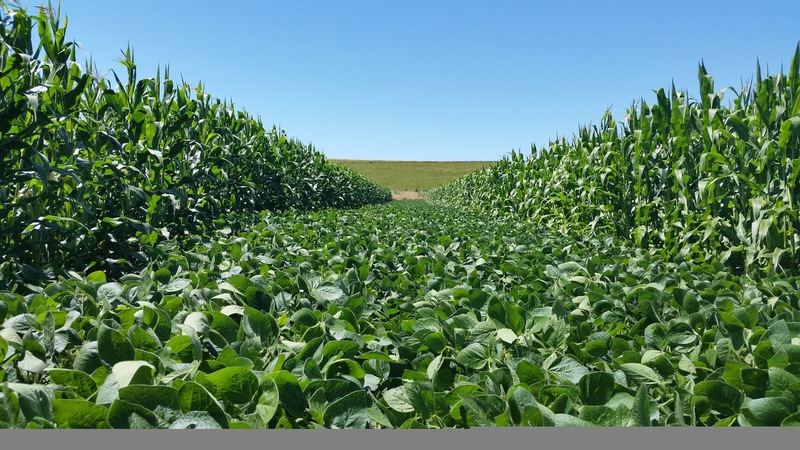 There has been a great deal of discussion lately about the topics of farm sustainability, food security, and environmentally sound agricultural practices. We, as farmers and stewards of the land, need to put our money where our mouth is. We may have the two most important jobs on the planet: producing food to feed the world and bearing responsibility for one of our most precious resources: the soil. We need to take our claims of placing environmental stewardship ahead of profit very seriously. Profit does not need to be at the expense of sound environmental practices; they are not mutually exclusive. perennial grass mix over a washout. One of our goals, as stated on this website, is to ELIMINATE erosion on our farm. This is and will continue to be a very, very difficult goal to reach and maintain. Our land has lighter, sandy soil types and quite a few hills, but where there's a will there's a way and we've made up our mind to make it happen. 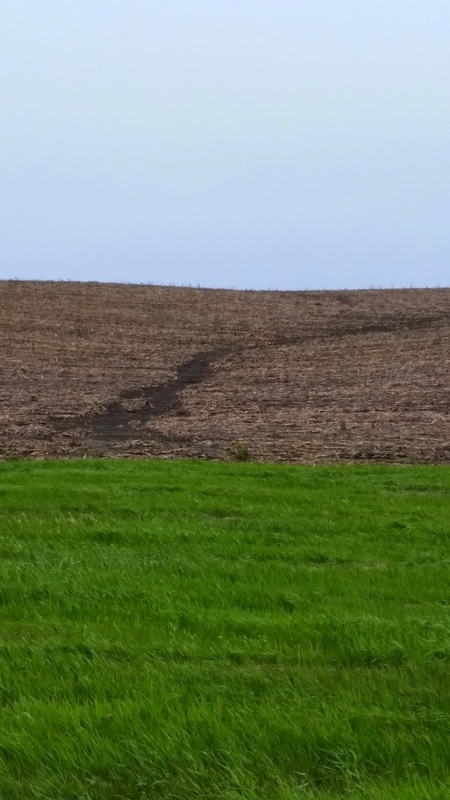 With all the precipitation this Spring there were massive amounts of erosion in pretty much every field in our area and although we had much less than most we were not immune to it. Not yet. One particular hillside had 4 separate washouts on it. We decided to plant a perennial grass cover to hold the soil in place since they would likely continue to erode. I know that some farmers dislike grass waterways through the middle of their fields and would prefer to operate end to end with no obstructions. 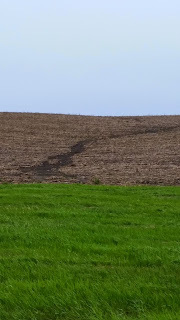 If the seed and fertilizer are washed away every year in these areas and nothing grows except weeds why would we not plant it to a perennial grass to hold the soil in place? likely be seeing a huge washout. strip-tilling it this Spring as it was the first time it had iron through it in 7 years. Field 5 has two predominant slope directions on different halves; one towards the south and the other towards the east. I strip-tilled and planted perpendicular to each slope on it's respective half of the field. This turned out to be a slight inconvenience throughout the growing season with field operations but with no erosion it was well worth it. There is no doubt in my mind that had we done conventional tillage and not strip-tilled we too would have endured the massive amounts of erosion that were prominent in the area. I strongly believe that the longer we continue to focus on the soil through the use of strip-till, cover crops, livestock integration, and rotations that we can get every one of our fields to perform like Field 5. 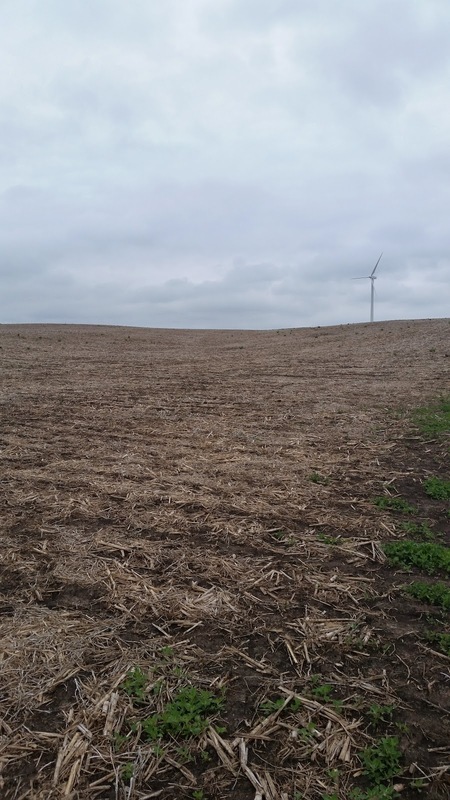 We have a plan for the future with crop rotations, cover crops, and a no-till/strip-till combination that we believe will get us to the point of eliminating erosion on our farm. These are but a few small actions on a small farm and their significance in the grand scheme of things is minuscule. Despite this fact, we believe that the way we operate our farm and focusing on soil health speaks volumes about us and what we represent. We will put our money where our mouth is. I challenge you to do the same. Thank you for reading. View from the tractor. Strip-till and auto-steer are a great combination. by clearing out the berm with a spade. previously applied 460 pounds per acre for my dad with no problems). This fertilizer mix was basically the same as what I had applied, except he added 100 pounds of urea per acre (my dad added 260 pounds of urea). No problem, I thought.The batch of fertilizer had been sitting on the tender truck for the previous five days and when we started to auger it into the air cart a bunch of wet, half dissolved, muck fertilizer poured right into the cart and down to the meter at the bottom. We spent the next hour cleaning the wet mix out of the meters. Once I finally got going, knife after knife began to plug. I couldn't go 20 feet without plugging a fertilizer knife. The batch of fertilizer was peppered with small, ping pong ball sized clumps of hard fertilizer and rocks. 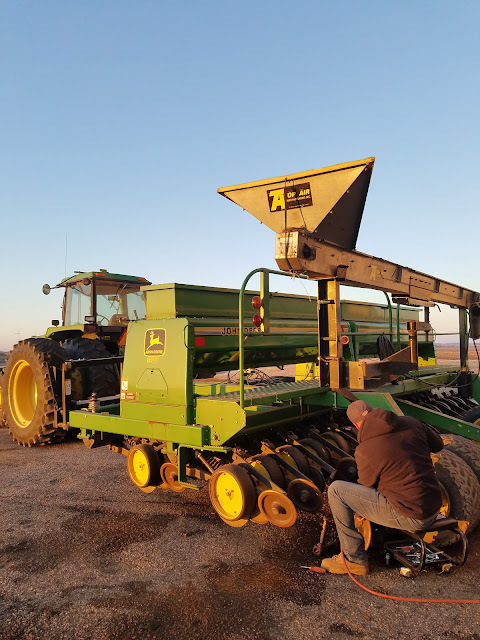 The rocks and clumps were small enough to pass through the screen when loading onto the air cart, but not small enough to pass through the fertilizer knives. I even found a rock the size of my smart phone on the air cart screen after we had loaded fertilizer; glad the screen caught that. The fertilizer batch was also partly saturated with moisture. All this made for a very, very long night. I wanted to finish before the rain started, so I kept battling through the bad fertilizer batch and finally finished at about 3:15am. It sure felt great to crawl into bed that night. So if you take away anything from this blog post; let it be my experience with a bad batch of fertilizer. I would recommend that fertilizer be brought directly from your retailer, and if at all possible, do not let it sit in the tender truck or the air cart overnight. My main task before we strip-till this fall is to build a smaller screen to use while loading fertilizer into the cart. It may take longer to load but avoiding potential headaches and downtime is a much more important priority. Thanks for reading and have a safe harvest. 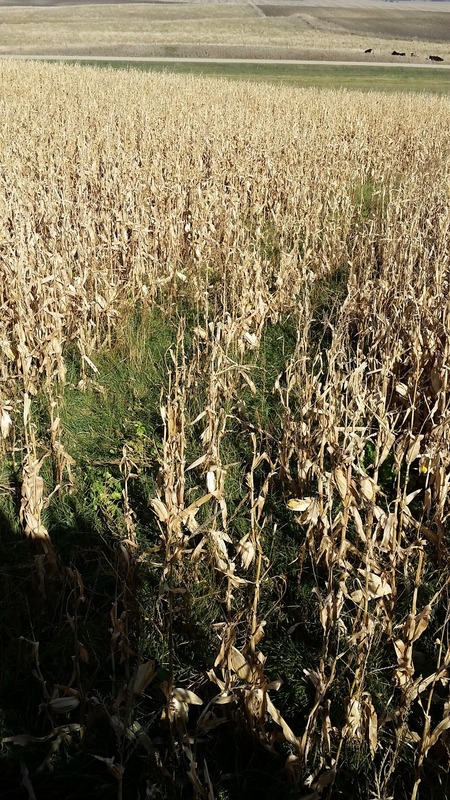 This was an alfalfa field planted to corn in 2013. In 2013 we planted corn into a field of four year old alfalfa with no tillage. It should be said that we had a good corn stand in 2013 of 32k plants per acre. However, it was absolutely annihilated by hail at about the V5-V6 growth stage. Looking at the field right after the hail I thought we were wiped out. It was heartbreaking. We gave it a few weeks and were amazed by how well a corn plant can recover from that degree of damage. 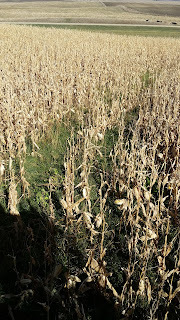 The stand had been reduced down to about 23k plants per acre, but still yielded about 120 bushels per acre (BPA). We were very surprised and happy with that result despite the circumstances. We had a beginning yield goal of 170 BPA. 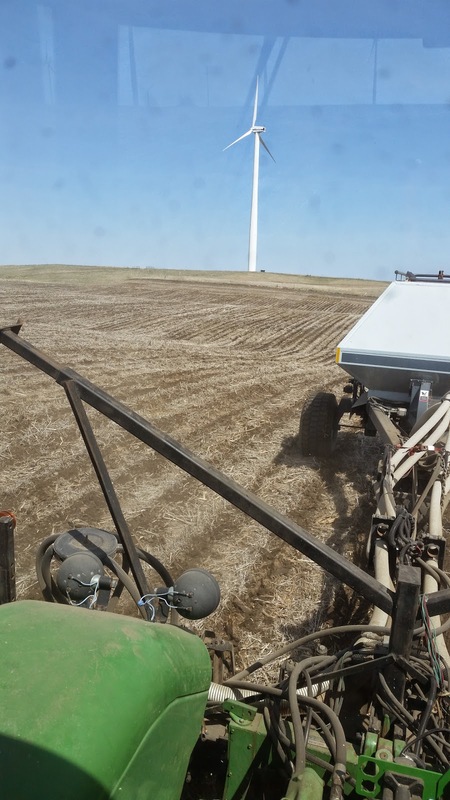 We broadcasted 260 pounds per acre (lb/A) of nitrogen/N (urea), 150 lb/A of phosphorous/P (diammonium phosphate [DAP]), and 100 lb/A of potassium/K (potash). We also allowed for an N credit of 50 pounds from the alfalfa. I do not like to broadcast fertilizer, but we didn't have banding equipment or a strip-tiller. Plus, our mind was made up not to do tillage. We set the the row cleaners on the planter down to make about a one half inch deep trench and clear out the alfalfa ahead of the seed opener. We also set the down-force on the planter as high as it would go. Our row cleaners have shark tooth blades and I think they worked much better than a finger style would have. There was a slight problem ensuring the seed trench was closed 100 percent of the time. However, we did not have a spiked closing wheel, which I think that would have eliminated the issue. The planter pulled fairly hard, but the setup worked very well. 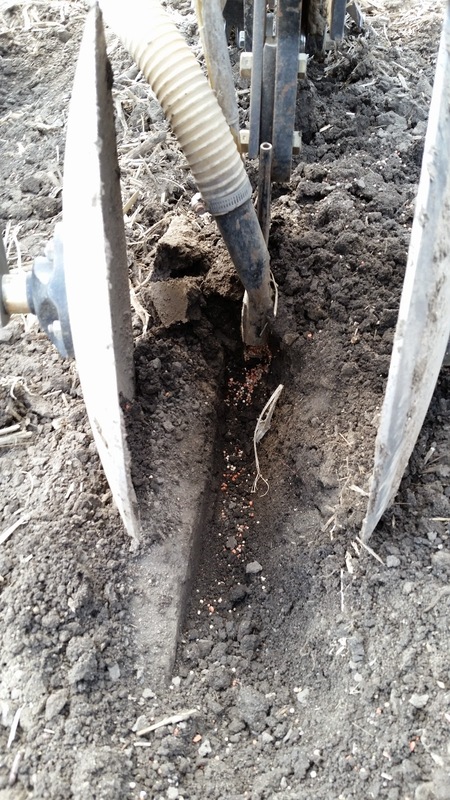 Our planter is set up for in-furrow pop-up fertilizer but we didn't use it. I think it would have provided some benefit in the no-till ground. We planted on May 8th and terminated the alfalfa with glyphosate three days later. Overall I think it worked well. I've also noticed, two years later, that the soil in this particular field has better aggregation than all of our other fields. This better soil aggregation is likely due to the fact it has not been tilled in 8 years. It also has the steepest slope on our farm and has no erosion whatsoever. Honestly, I felt a little guilty strip-tilling it this spring. My dad had some alfalfa ground he wanted to plant corn into for silage. I worked on him all winter long to convince him to just plant directly into it. He's a little old school and was stuck on the idea of plowing it up. 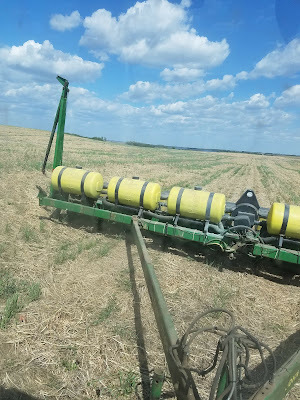 I think the fact that we sold all of our tillage equipment helped persuade him, since there was nothing he could readily borrow from me to plow up the alfalfa. I would have preferred to get a pass of glyphosate on it last fall, but his mind still wasn't made up, so it didn't happen. It turned out to be quite a different process than what I had done it 2013. I strip-tilled on May 4th and planted on May 8th (I'll explain why in a bit). We put all the fertilizer down (460 lb/A total) with the strip-tiller. We used 260 lb/A of urea, 130 lb/A of DAP, and 70 lb/A of potash. We allowed for an N credit of 50 pounds from the alfalfa. I ran a little slower to avoid plugging the machine; 3.5-4 MPH. Since the alfalfa was still growing the strip-tiller cut more of a slot rather than building a berm, and the closing disks didn't do much of anything. It pulled much harder than in soybean stubble, which was to be expected with alfalfa's extensive root system. I ran it about 6 inches deep and we could actually open up the slot by hand and see the band of fertilizer underneath (wish I had taken a picture). I was nervous to plant right after the strip-tiller for fear that the seed openers would directly follow the cut of the fertilizer knife and drop the seed right into all that fertilizer. It was supposed to rain, and it did, so we waited a few days for the fertilizer slot to mellow, grow back together, and close itself. It worked great and we planted on May 8th. Ideally, I would have liked to terminate the alfalfa 5-7 days after planting, but certain events dictated otherwise. 4840 was retired by an electrical fire. 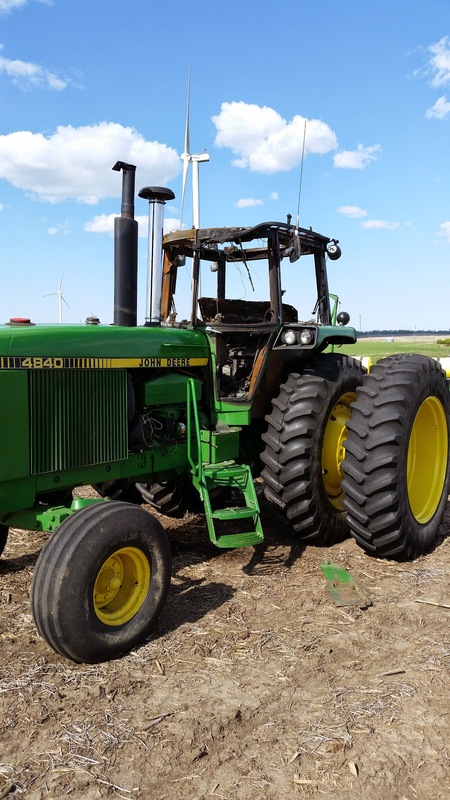 Termination with glyphosate was delayed until May 22nd by rain and an electrical fire, which claimed the 4840 and left us without a tractor to pull the sprayer. 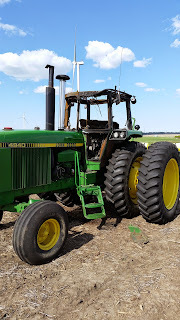 Luckily no one was hurt and we were able to get the fire out before it took the entire tractor. 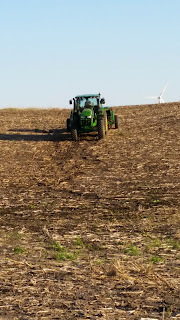 Thankfully we were already done planting and the tractor was being used by a neighbor. We put a lot of work and money into that tractor and had planned to keep it around for good. Like any reliable piece of equipment, we will be a little sad watching it go. Overall, planting 2015 went great until the very end and we are thankful and excited to see the corn coming up and being one step closer to harvest. Hopefully we can start side-dressing nitrogen in the next week or two if the rain holds off for a few days. Thanks for reading and have a safe and enjoyable summer.